Back in 1998, the Andreopoulos family decided to go back to their roots and convert their diner into a steakhouse. And no, it wasn’t because the building was once a link in the Bonanza chain. The place was named Nick’s 22nd Street Steak House, for the family patriarch, Nick Andreopoulos. Nick had extremely legitimate old-school chops. In the 1960s, he spent time as a “broiler man” at the London Chop House, working alongside the legendary chef Philip “Pancho” Velez. After striking out on his own with Macomb County places like Grecian Gardens and the Wishing Well, Nick and his sons Bill, Harry, and George settled in at the corner of 22 Mile and Van Dyke in 1992, converting the Bonanza into a family diner. The family obtained a liquor license and proceeded to remodel the place. Nick’s 22nd Street Steak House continues to thrive, even though Nick died in an auto accident in South Dakota while returning from a hunting trip in 2012. The place is basically a standard American steakhouse but with a casual, neighborhood hangout feel. They offer an array of well-prepared Angus steaks, plus seafood and pasta dishes that come in way more than ample portions (a habit from their family diner days, Bill says). A few hints: In season, they have a mouth-watering fresh lake perch, either deep-fried or pan-fried. 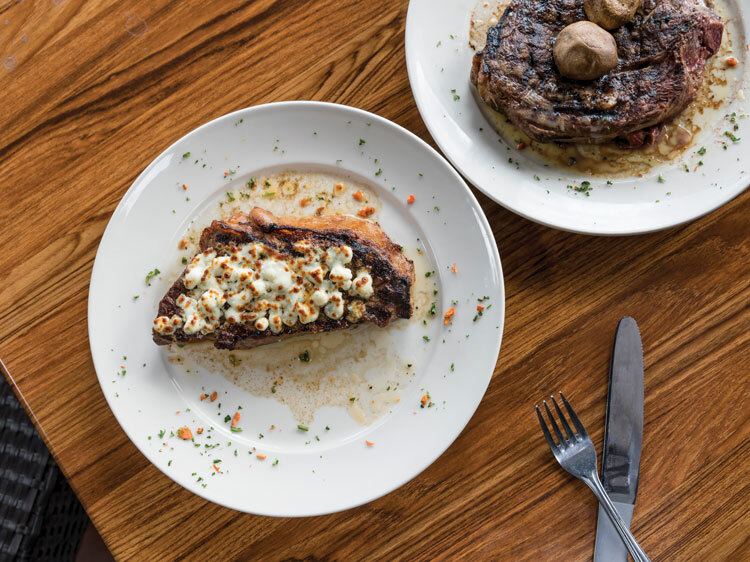 Or maybe opt for the baked blue cheese as an add-on to your steak. You can also get classics like lobster tail, prime rib, lamb chops, and a Chateaubriand Bouguetiere with béarnaise sauce. There are plenty of other old-school touches, too, like frog legs, roadhouse style or deep fried. Rounding out the menu are some Italian dishes — including a chicken picatta with a side of creamy fettuccini Alfredo — and touches of Greek, including Saganaki cheese, and their mother’s grape leaves recipe. According to Bill, they’re always tweaking along the edges, departing from the classics with items like a sesame ahi tuna or a veggie-friendly Asian stir-fry. “I’m not the smartest guy in the world, but I can outwork him,” he says with a laugh, adding that their main goal is consistently good food and attention to detail, including doing all their butchering in-house. Nick’s is also revamping their whole dessert menu. Not that they really need to. While the desserts looked delicious, nobody from our party had room left, plus we walked out with doggie bags of pasta, steak, and perch. The three Andreopoulos brothers are keeping busy both at Nick’s and a sister restaurant in Algonac called Catch 22 Bistro. If the perch at Nick’s is any indication, we need to plan a short road trip soon.